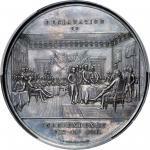 (Circa 1852-1854) Declaration of Independence Medal. Silver. 91 mm. 295.0 grams. By Charles Cushing Wright. Musante GW-183, Baker-53G. Specimen-63 (PCGS).A supremely important mid-19th century American medal that we are delighted to be able to once again present for sale. Reflective prooflike surfaces are beautifully toned deep violet and pastel blue over the silver gray. A few little rim nicks are seen on the high wire rim, none individually significant. A fine die crack that extends from the reverse rim right of 12 oclock all the way past the center of that die to the E of PEACE (in the 1763 line) likely explains the great rarity of this medal, in any form.<p>The design occasionally appears as a contemporary produced electrotype, and struck copper impressions also exist, but they are all extremely rare. 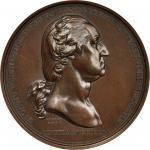 This medal was first published in <em>Nortons Literary Letter</em> in 1857, described therein as bronze. The first auction appearance was in the Ed Cogan sale of March 1862, where a bronze specimen realized a very healthy $15.50. We also record offerings in bronze in the Chapman Brothers sale of the Bushnell estate, June 1882, lot 1275; the Chapman Brothers sale of the Warner collection, June 1884, lot 2215; Wayte Raymonds sale of the W.W.C. Wilson collection, November 1925, lot 874; and a silvered bronze specimen that sold in Presidentials sale of December 2003 sale, lot 368 and again in our Rich Uhrich sale of February 2008, lot 3748. We believe there are only two to four struck bronze specimens extant, but all authorities agree there exists just this one silver specimen.<p>We are aware of only four past auction appearances of this silver medal, three of which we had the pleasure of presenting. The earliest appearance was in 1882, when the landmark collection of Charles Ira Bushnell was sold by the Chapman Brothers, an historic sale in more than one respect. Not only was the collection extraordinary, but the fact that the young Chapman Brothers got the contract to present it was a landmark event in their careers. The medal was described by them in straightforward fashion, "Obv. Signing of the Declaration of Independence, the same as the rev. of above. Rev. A tablet inscribed with the important events in the history of America; above, a scene of the landing of Columbus, and beneath, view of houses, wharf, ships and light-house. Silver. Proof. Unique in this metal." 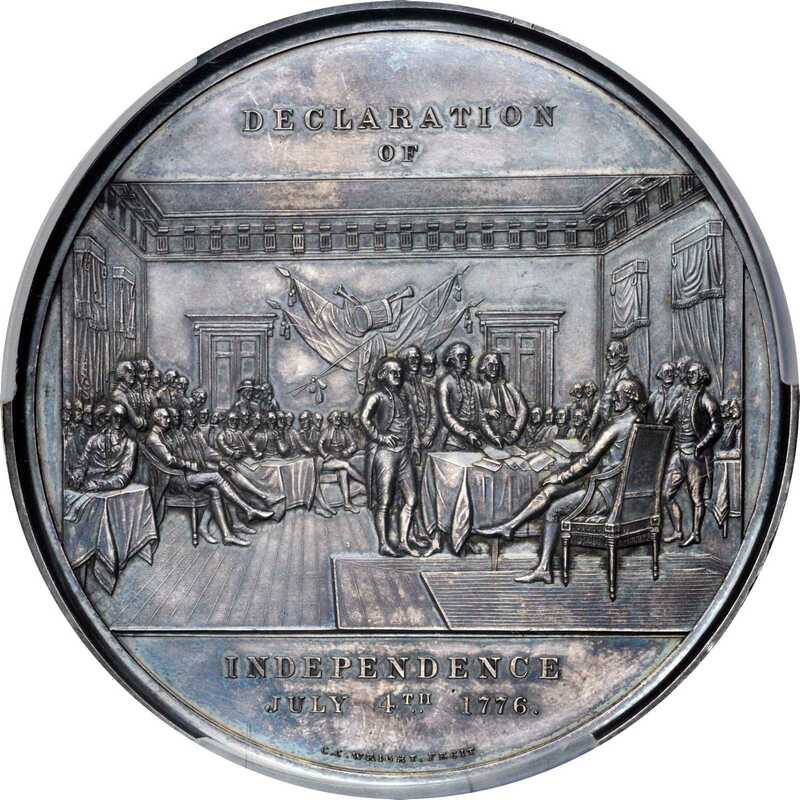 The final statement seems rather certain, suggesting direct knowledge that this impression of the medal might well have been a lone specimen in silver, struck for Bushnell specifically, as he is known to have commissioned works for his own collection. <p>T. 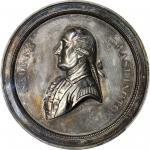 Harrison Garrett was the buyer of the medal, for $36.00. It didnt reappear until our Garrett sales, described as "Proof with some minor hairlines. A truly magnificent piece." In 1986, we saw it again, described as "Proof with some hairlines and a few trivial rim marks. 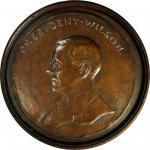 ...Bushnell was a patron of Wright, and this medallion may have been struck especially for Bushnell as a unique specimen. ... A highly important piece of Americana, and one of the rarest (actually a specimen cannot be rarer) of all Washington-related items." Once again, a century after the first appearance, the same suggestion was made, that this was unique in silver.<p>Today, more than three decades later and in an era when numismatic research and access to information are at unprecedented levels, no other example in silver is known to us. Just as the Chapmans did more than a century ago, we confidently offer this piece as unique in silver. 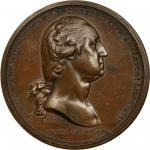 <p>This medal, and its related mulings, have long been under appreciated. This unique silver strike, with its fine provenance and beautiful in-hand appeal, has been a centerpiece of every collection it has appeared in. <p>Ex S.H. and Henry Chapmans sale of the Charles I. Bushnell Collection, June 1882, lot 1274, at $36; our sale of the Garrett Collection, Part IV, March 1981, lot 1910; our sale of the Julian Leidman Collection, April 1986, lot 4126; our sale of the Charles A. Wharton Collection, March 2014, lot 2077 where it realized $41,125.